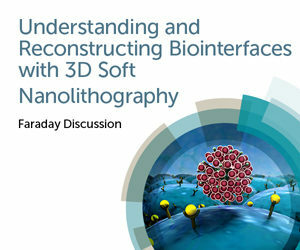 We’ll be discussing some of the latest developments in nanolithography of biointerfaces at our Faraday Discussions meeting in London, UK from 3–5 July 2019. Topics for debate include multidimensional micro- and nano-printing technologies, preparation of multivalent glycan micro- and nano-arrays, glycan interactions on glycocalyx mimetic surfaces, as well as surface functionalization and characterization. We hope you can join us: submit your oral abstract by 11 October! In the meantime we’ve collected together some recent articles in this area from across the Royal Society of Chemistry porfolio to whet your appetite. Happy reading!